When it is so easy to reach quite so many people so effortlessly on social media, why should an author go to the bother of making friends with a bookshop? Haven’t we all been told endlessly that bookshops are a bit quaint and old-school, a dwindling part of the reading landscape where the brave new world of shopping is both digital and instant? Didn’t the number of independent bookshops drop to below a thousand in the whole country for the first time a couple of years ago, proving that their time has passed? These are all good questions. And, with all the hundreds of books and authors out there, you might also ask - does a bookshop really need a relationship with another author? Ultimately, is the author/bookshop relationship really one that is worth the effort? I would like to convince authors of the beauty of being part of the love story with bookshops and answer Yes! It is a relationship that is thriving and has benefits on both sides. But like all relationships it is always helped by both parties trying to understand each other. Walk into a bookshop, particularly an independent bookshop and it is quite possibly small. It is possibly on a side road, and not even in a main shopping area. Quite possibly, it won't even have that many books on its shelves. But what you are seeing is a portal to a wonderful, vibrant reading community that gathers around bookshops. And to fully appreciate that portal you need to be part of it. Perhaps the easiest place to start in learning to love bookshops is understanding who is going to bookshops, and why, in this increasingly frenetic, digital world (although the clue is probably in the question). It seems to surprise folk to learn that around half of books in the UK are bought in physical stores, even though the UK is the country in Europe with the highest percentage of online shopping. 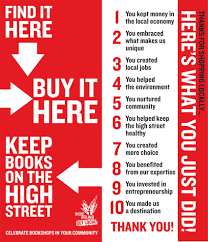 From the dark days of the financial crash, high streets in crisis and inexorable rise of the popularity of e-books, those bookshops who have weathered these storms have done so by focusing on what they do well: promoting three strong values of community, expertise and curation. These three values are only growing in importance in our fractured times. Bookshops are recognised as being a favourite ‘third place’ – somewhere that is neither home nor work. Bookshops are valued as a haven for those seeking a connection in an ever-more isolated world. But bookshops are not church or pub, they are places where people gather united by their love of books and of reading. Bookshops are trusted places for parents with children with huge appetites for books who need to know they are reading the right things, for reluctant readers, for gifts buyers, teachers, school librarians and, yes, authors. Anyone who likes to be part of that conversation about books is drawn to a bookshop as the beating heart of a vibrant book community. Pretty much anyone working in a bookshop is doing it because they have a passion for books. They spend every hour of their working day talking to people who want to buy books, about which books they should buy. 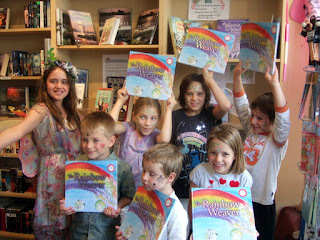 Talking enthusiastically about books is what booksellers have chosen to do as their job. The sort of people who like to go to bookshops are drawn there happy in the knowledge that the bookshop is full of like-minded people and expert advice. It’s a bit like shopping with a friend. Forget the smell of books (do books really smell that amazing - did you ever buy a book because of the smell?). I’m more sold on the look and feel, the beauty of books. What about the thickness and the love and attention a publisher has clearly put into the format and the jacket or those sprayed edges? That tells me a lot. I want that book on my shelves and I want my customers to pick it up and love it as much as I do. That's what brings people into my shop. Statistically and consistently, bookshops remain by far the biggest factor responsible for people trying and discovering new authors. It is estimated that serendipity and discovery generate as much as two-thirds of UK general book sales – so most people do not expect to walk into a bookshop and just to leave with what they set out to buy. They actively want to engage – with the curated stock choice, with the experts working there and they like to walk out with something unexpected. The internet has proved itself excellent at delivering books. It’s a wildly impressive achievement. But is it enough for book buyers? Internet shopping is fine as long as you know what you want or are happy just to buy 'more of the same'. This may be part of the reason we have so many incredible bestsellers which just sell more. The ‘fat-middle’ (or mid-list which is where most authors are) might find they are not as well served by a platform which delivers almost unlimited choice without curation. They might be hard to find. Many book lovers have found this is not satisfying either. They are excited by discovery and serendipity. So what else happens in this marvellous magical portal? Bookshops are definitely about creating a calm space in which to browse, but there is an awful lot more going on under the surface that draws people to this beating heart. In their role of trusted experts, bookshops are often putting together events to promote new authors that have a good fit with their customers. They are putting together lists for library supply. They are curating lists for book fairs, recommending book club choices, reviewing and recommending all the latest and new books and generally acting as a hub for all things book-related. For every book on the shelf, a bookseller will always know about and be able to recommend dozens more. And for every customer through the door, there are dozens more reached through recommending to other book enthusiasts. A bookshop is often the first trusted port of call for schools looking to bring author events to their school or wanting bookfairs and in this way we will be reaching thousands of school readers even if those children never themselves to get the chance to set foot in a bookshop. And being part of that wonderful book-loving community means it is really satisfying for a bookseller with a strong, personal relationship with a local author to be constantly working to find that author new readers - hand-selling their books in the shop, getting them events, putting their books into book fairs and recommended reading lists. If you know an author this is even more rewarding than simply recommending a book that you love. We really value those relationships too. Bookshops play a unique and important role in the world of books and this is the story of how they have survived. What would be great would be to encourage all authors to adopt a bookshop and to build a relationship that is great for both sides. I’ll leave you with my first tip. Visit bookshops and take advantage of their great enthusiasm and passion, offered free of charge. And buy your books there! It could be the start of a beautiful relationship.